Home » Copycat Restaurant Recipes » Bennigan’s Monte Cristo Sandwich – make this famous sandwich at home. 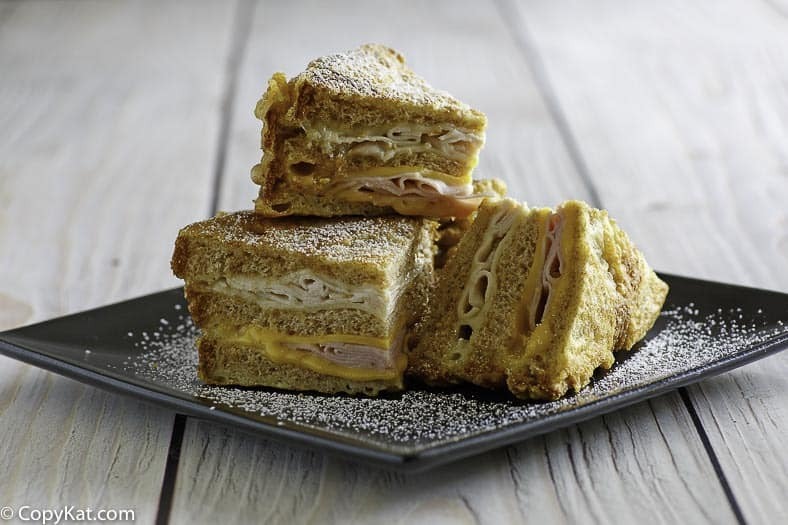 Bennigan’s Monte Cristo Sandwich – make this famous sandwich at home. Bennigan’s Monte Cristo Sandwich – talk about guiding the Lilly this deep-fried triple-decker sandwich is served up with raspberry preserves jelly comes the Bennigans Monte Cristo Sandwich. With only 15 locations in the continental US, chances are you don’t live near a Bennigan’s and can’t get yourself one of their delicious Monte Cristo Sandwiches. But with my copycat recipe, you can make it any time you want in your own kitchen. It is thought that the Monte Cristo sandwich was a variation of the classic, French, Croque Monsieur, which has a lot of variations of its own. It was Disney that made it popular in the USA by serving it in restaurants at Disneyland Anaheim in the 1960s. From there, it spread across the land, changing according to local tastes along the way. Monte Cristo Sandwich recipes have evolved like barbecue sauce, they change according to where you are in the USA, and its batter is a tightly kept secret. 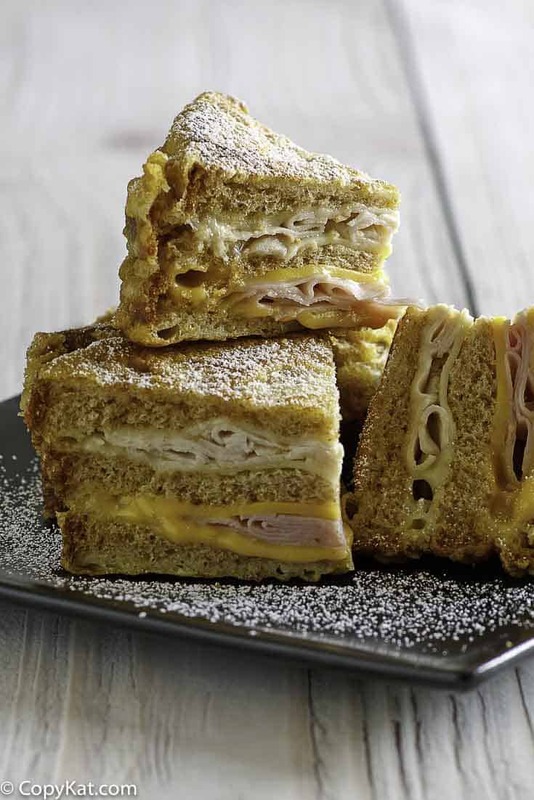 In many regions though, the Monte Cristo is a savory sandwich of fried ham and cheese. Most often, it is dipped in its entirety in a batter and either pan fried in butter or deep-fried in oil or fat. Other variations make the sandwich more sweet than savory. And still, others change out the ham for sliced turkey. In some parts of the US it is a closed, grilled sandwich while in others, it is an open sandwich with only the bread battered and fried, then assembled as a sandwich before being heated slightly under a broiler. Bennigan’s Monte Cristo sandwich is sprinkled in powdered sugar and served with preserves. This sandwich is crisp on the outside and custardy on the inside. If you like French toast, then you will enjoy this sweet and savory, deep-fried, triple-decker sandwich, served with raspberry preserves for dipping. Try your own variations by choosing different sandwich meats and cheeses or by experimenting with different pieces of bread. And anyway you slice it, you will love the classic Monte Cristo Sandwich. While Bennigans may not be around anymore, you can still enjoy their famous Monte Cristo sandwich at home. Place turkey and Swiss cheese on one slice of bread and ham and American cheese on another slice of bread. Place third slice in-between and secure the triple-decker sandwich in the corners with toothpicks. Serve with raspberry preserves, pickle garnish and your favorite side order of French fried potatoes. Ran a Bennigan’s for several years before they started mass closing. Here is how to make them the real way. 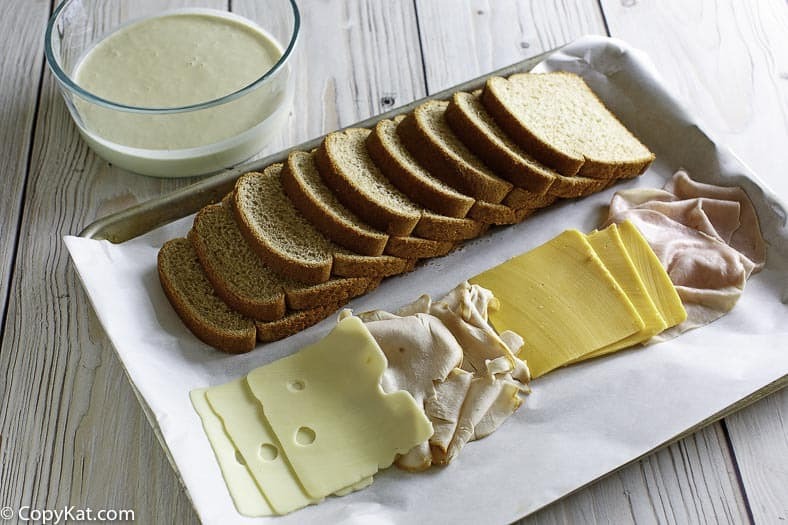 1 slice bread down, stack Turkey and Swiss on it, then middle slice bread. Put Ham and American Cheese on then top slice of bread. Pull out plastic wrap over the edge of the table and lay it over the sandwich. Smash the sandwich as flat as you can get it and keep rolling it pulling towards you to keep it tight. Fold over plastic wrap on edges to make sure it has no air leaks. Put in the fridge for at least 12 hours. Bread should be fresh and moist when you start your assembly. After it has sat, pull it out and cross cut in an X from corner to corner to get 4 pieces. Dip it in “Tempura Batter”, that is what we used and make sure it’s well coated. Drop it into a 350 degree fryer until Golden Brown. I preferred to let it get a little darker to make sure cheese is melting inside. Once out of fryer, put it on an absorbent tray and or stack of paper towels and sprinkle with powdered sugar. Dip in Raspberry Preserves. If done correctly, the sandwich will not fall apart in fryer as the sandwich should be very dense. I tried this and…. bread desintegrated as I put them in the fryer…. I’m trying this 2marro I love Bennigans Monte Cristo’s… do you deep fry this …? if so what temp, and how long? Or just fry each side in a pan with grease a couple inches deep then flip and do the other side…If so how long and what temp…thanks for this! I would try to fry this in a deep fryer, or a makeshift one. The oil should be 350 degrees when you fry this. Wow! I made this Monte Cristo last night and it was like I was at Bennigans again. It was great. Thank you so much for this recipe, I truly appreciate this. I will be making this again for lunch today lol! So happy I came across this site. I WAS WATCHING THE FOOD CHANNEL, AND I WENT STRAIGHT TO THE WEB SITE TO SEE IF THERE WAS A RECIPE FOR BENNIGAN’S MONTE CRISTO. THANK YOU I WILL BE SHOPPING FOR THE INGREDIENT’S TOMORROW.WILL LET YOU KNOW HOW IT TURN’S OUT. Donald, let me know how this tastes. I hope you enjoy the recipe. Just tried this tonight…it was exactly perfect! Thanks for posting this! I have been wanting a monte cristo for a while, and decided to take matters into my own hands since the bennigan’s closed nearby. Again…..phenomenal! Bought my son a deep fryer for Christmas. Today I am making my first monte carlo. I have missed them so much. Can’t wait! If your in the mood and the area, the Bennigan’s in Warsaw, Indiana is still open. Its in business with a Ramada hotel and the Wagon Wheel Theater. The one in Angola, IN was still open last time I was up there a few years ago too(also hooked up to a hotel). I just made these last night and they were delicious. I substituted smoked cheddar cheese for the american and it was delicious! I also used Challah for the bread just for my own personal taste but thank you thank you thank you for this. I have been craving this for so long since they went out of business! Oh my gosh!! My son has been wanting a Bennigan’s Monte Cristo since they closed and now he is in the kitchen making one!!! He is SO happy!!! Thank you. I made theses last night, and have a few things I will change for next time. I agree with Don about cutting the sandwiches in half before frying, especially if you don’t have an industrial sized deep fryer. Also, I will cut the crusts off of the bread, and smash the samdwiches down pretty well before battering. This way there is less fluffy bread to act like an oil sponge when the sandwiches are deep fried. Great taste, and it went perfect with my wifes home made raspberry preserves! If you make the sandwich the night before and wrap it tightly in plastic wrap, store in the fridge overnight. It helps with the spongy bread you’re talking about. This recipe was perfect. I used hot pepper cheese instead of american, I cut the sandwiches in half, then wrapped them in plastic wrap and put them in the fridge for a few hours before I battered and fried them. This help to keep them together while dipping them in the batter. Thank you, thank you, thank you! I will be trying this recipe out this weekend!